I grew up not understanding – or caring about – calories. When I started to get very serious about my weight loss, though, I started learning and paying attention…and I started to see results. I am a huge fan of the Fitbit, which I honestly believe is the best calorie tracking device on the market today. I love their products – I’m currently rocking their One model and I really love the Force as well, which was discontinued due to some consumers having allergy issues with the band (a replacement for it is in the works and I’m very excited about that). I also love that once you purchase, everything else is free – and they have beautiful online and mobile interfaces that present you with a lot of information. I also love how they seamlessly work with My Fitness Pal, another tool I use on daily basis to record the calories I consume. Whatever calorie tracking device you choose to use, you need to understand how calories work and how to use the information these devices present you with to your advantage. So theoretically in a 7 day week, you’d want to have a 500 calorie deficit a day to lose 1 pound and a 1,000 calorie deficit a day to lose 2 pounds. No. All sorts of things add to your weight – water retention, muscle replacing fat, etc. – and even though you don’t see a difference in the scale, you may have changes happening in your body that you’ll soon be able to see. You can’t control these random things that affect the scale, but you can control your calories consumed and burned – and that’s what I want you to understand. Once you “get” what I’m saying here, you will see results. To lose weight, you need to burn more calories than you consume, plain and simple. To find out how much you’re burning if you don’t have a Fitbit or other device, you need to calculate your Basal Metabolic Rate (BMR). This will tell you how many calories your body needs to function if you spent the entire day sedentary. In the brackets, we’ll calculate BMR first. I’m going to be using a 25 year old woman who is 5’5″ and 150 pounds. •M – Calculate your weight in kilograms by taking your weight in pounds and dividing by 2.2 (example: 150 pounds / 2.2 = 68.18 kg). •H – Calculate your height in centimeters by taking your height and multiplying it by 2.54 (example: 5’5″ is 65″ x 2.54 = 165.1 cm). •A – Enter in your age here. We’ll use a 25 year old female in this example. •S – For males, add 5 for S. For females, subtract 161. For a 25 year old woman who is 5’5″ and weighs 150 pounds, her BMR is 1,428. Now she needs to account for her activity level (L). •Sedentary – Little or no exercise. •Lightly Active – Light exercise, sports 1-3 days a week. •Moderately Active – Moderate exercise, sports 3-5 days a week. •Very Active – Hard exercise, sports 6-7 days a week. •Extra Active – Very hard exercise, sports and physical job or 2x training. So I’m going to put our example woman into two calories. Her rest days will be calculated with the sedentary equation and her workout days will be calculated with the moderately active equation. Always figure two numbers for yourself, one being the sedentary. You will have rest days and you’ll need to reduce your calories a bit on those days to stay on track. 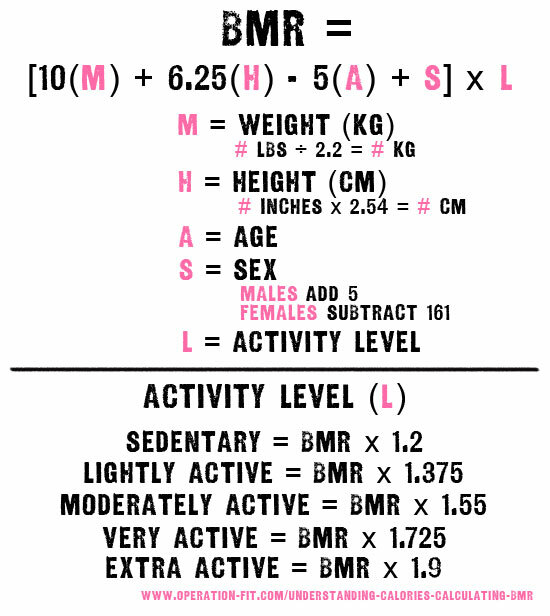 Calculate your own BMR and use it to help you set up an account with My Fitness Pal or another food tracking app of your choice, using these numbers as your guide. I find My Fitness Pal tends to aim a little low, so I always adjust for what I feel I need and it hasn’t failed me yet. Set your goal for your workout days and be aware of how much you want to decrease on rest days. Yes and no, but I bet it’s pretty darn close. When I calculated my BMR numbers, I found them to agree what I see with my Fitbit (and before that, my bodybugg). However, it really depends on the workouts you’re doing. Someone who does strength training for 30 minutes won’t burn as much as someone doing cardio for 30 minutes because they’re different workouts and you’re in a different heart rate bracket. That’s why I can’t emphasize enough how valuable a Fitbit is – it tells you exactly what you’re burning and it takes the guesswork out of the equation. If you don’t have one, though, you can use these numbers as a guide to help you create your deficit. Calculating your deficit and understanding calories consumed. Going back to our example woman, if she’s looking to lose one pound a week, she going to want to eat about 500 calories less than what she burns. On rest days she would keep her intake around 1,200-1,300 and on workout days she would want to eat around 1,700-1,800 calories. This is where it gets tricky, though. People think the less you eat, the more you lose. That’s not always the case. Remember, weight loss is as much about what you eat as it is about how much you eat. If you’re working out for weight loss (which you should be), you need to fuel your body with the proper calories for it to function. If you don’t, your body goes into starvation mode, which means that it holds onto every single thing you put into it because it has no idea when you’re going to properly fuel it again. You should never consume less than 1,200 calories a day no matter what your BMR tells you, it’s not healthy. Use 1,200 as your absolute baseline for your rest days, and keep it in the 1,200-1,400 range to be safe. Also remember that calories are not created equal. 100 calories of fruit or veggies will have a different effect on your body than 100 calories of chips or cookies. You should cut all of the CRAP out of your diet – Carbonated beverages, Refined sugars, Artificial food, Processed food – and get back to basics: fruits and veggies, lean meats, whole grains, dairy. Once you clean up your diet, hydrate properly, and work exercise into your daily life, you will start seeing results.